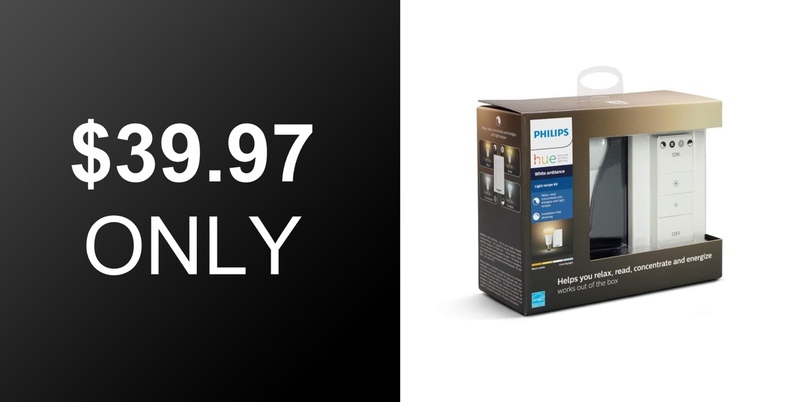 This installation-free Philips Hue smart dimmable lighting kit is available to purchase right now for just $39.97. The offer means you will immediately benefit from a 20% discount on price and get a hassle-free smart bulb from one of the world’s leading manufacturers. Philips has managed to get itself into a position where it is one of the leading contenders as far as smart home hardware is concerned with its Hue range. And rightly so, in all honesty. The Hue range pretty much led the pack as far as modern and affordable smart home equipment is concerned and although a lot of competition has popped up in the last few years consumers generally prefer to reliability and quality of the Hue equipment. And that is exactly what you are going to get with the deal. But there is also a slight difference with this. This particular kit doesn’t actually require the purchase or installation of a Philips Hue Bridge in order to operate. The kit comes with a Philips Hue White A19 60-Watt equivalent light bulb as well as a Philips Hue Smart Dimmer which can be mounted without any installation whatsoever anywhere you like. All you have to do is screw in the Hue white LED bulb in your standard fixture and switch on the light and you are good to go with this dimmable kit. If that simple on/off and dimmer functionality is all that you require then you are good to go. However, this does have the ability to integrate with an existing Hue installation and even offer voice control via Alexa, Siri or Assistant if you have the relevant Bridge hardware and an Alexa, Siri or Assistant-capable based device to give the commands to. That makes it a wonderful deal for excellent hardware which can be used exactly as it is out of the box or which can be part of a larger smart home installation. 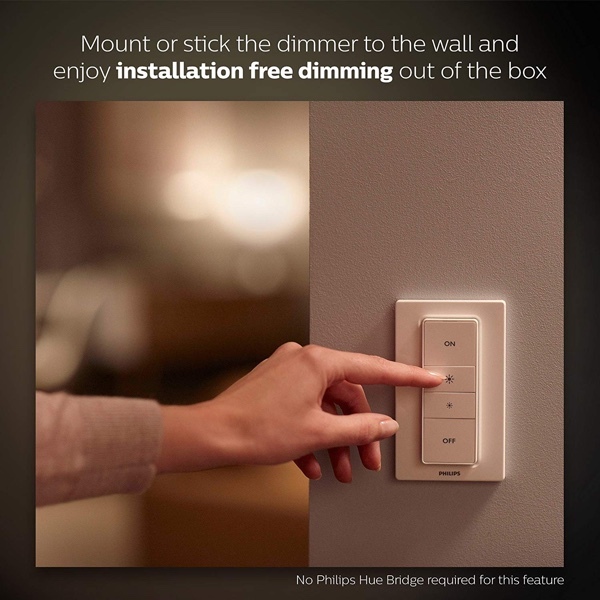 If you are in the infancy as far as smart home technology is concerned, or even if you are looking to grow what installation you already have in place, this hassle-free Philips Hue kit is a great deal.